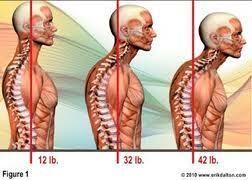 Mobile technology has not been kind to our backs and necks, Prather says. "We’re hovering over laptops, iPads, and smartphones all the time," she notes. "This head-down position strains the muscles in the neck, and the pain can extend all the way down your spine to your lower back." Take frequent breaks, and try to look straight ahead - rather than down - while using a laptop, tablet, or phone. You can buy a stand to help hold your laptop or tablet at a more back-friendly height and angle.